Aloha Tower Welcomes All Honolulu Hawaii Vacationers. Aloha Tower Welcomes All Honolulu Vacationers! 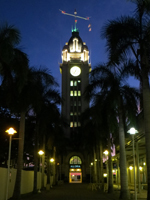 As you’d find in almost any other city with some history, Aloha Tower is one of those most-famous city landmarks that is now overshadowed by its more-recently developed metropolitan surroundings. Heck, even the cruise ships are taller than the tower these days (see photo in the footer of this page). 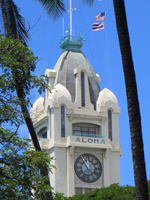 Nevertheless, in the early days of Hawaii tourism, when visitors arrived almost exclusively by ocean liner, every Honolulu Hawaii vacation began at this tower of welcoming. 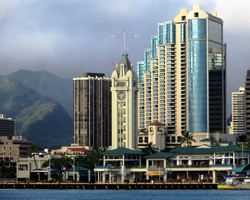 Once the tallest building in Honolulu, and still the second-most recognizable landmark in the Honolulu skyline (behind Diamond Head, of course), the tower has played an important role in Hawaii history. 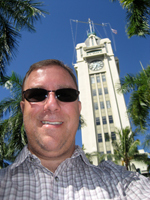 For that reason, and because of its listing on the National Register of Historic Places, I’d have to call Aloha Tower one of the most iconic Honolulu attractions. Yet, in spite of that, it’s usually not very crowded, it’s free to visit, and it’s one of the quickest/easiest scenic Hawaii sightseeing things to do in Honolulu. Furthermore, when you understand the warmth and hospitality encompassed in the meaning of the word itself, I’d say everybody needs some Aloha in their Hawaii vacations. That’s why I chose a picture of this tower as the very first image on the Hawaii-Vacation-Fun home page. When it was constructed in 1926 as the Harbor Master’s control center for monitoring the increasing amount of boat traffic throughout Honolulu Harbor, Aloha Tower was the tallest structure in the Honolulu skyline. As such, the tower housed the largest clock in Hawaii, which also happened to be one of the largest clocks in the United States at that time. Interestingly, the tower was strafed by gunfire from Japanese fighter planes during the December 7, 1941 bombing of Pearl Harbor. In response, it was painted with military camouflage patterns throughout the remainder of World War II. To me, I find that hard to believe, because it was designed as a landmark that was intended to stand out. Rather than plagiarizing all the Honolulu Harbor and Hawaii history information posted on the walls at the base of the tower, I’ll just encourage you to look at these displays for yourself. The posters aren’t particularly well maintained, unfortunately, but they do contain a lot of neat old photos and interesting historical anecdotes. When I first arrived in Hawaii by DC-10 in 1981, I had an image of this fanfare welcome in my mind. I was disappointed… at least until I got out to the beach and forgot all about the airport. Apparently it was practically a Honolulu holiday every time the great ocean liners of the past used to pull into port. If you’ve ever seen those old movies with all the fanfare of streamers, hula dancers, lei draping, and band playing, that’s exactly the way it used to be when the ships arrived. That’s one of maybe three or four events in Hawaii history that I really wish I could have seen. By the way… if you would like to experience a taste of this arrival tradition, you can arrange an airport lei greeting - CLICK HERE! (Link opens a new window/tab). It was before my time, but I’ve heard that the SS Lurline was the pride of the Matson Line fleet and a frequent sight at the piers alongside Aloha Tower. And just recently, I was looking at some old family photo albums when I came across some pictures of family friends who began their own Hawaii vacations on the Lurline. Apparently it was a big enough deal to write the name of the ship right on top of the photo. Anyway, Aloha Tower was the starting point for almost everybody’s Hawaii vacation fun until the 1950’s when commercial airliners replaced ocean liners as the primary means of visitor arrivals. 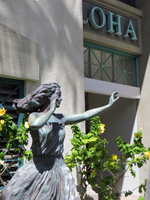 Okay, I can’t resist giving you one more historic highlight… in 1911, the legendary Hawaiian waterman Duke Kahanamoku set his first world record for swimming in Honolulu Harbor next to the site where the tower would later be constructed. That’s another event in Hawaii history that I wish I could have witnessed. Though not recorded on the displays at the foot of the tower, Honolulu Harbor also played a role in my own personal Hawaii history. My first summer job as a high school junior was on a tug boat down at the piers by Aloha Tower. It was filthy work, but it bought me my first car, so it was worth it! 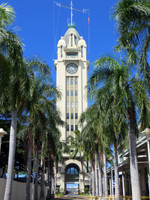 In 1994, the entire esplanade where the tower is located was extensively renovated and converted to the Aloha Tower Marketplace. In addition to the cruise ship terminal, which remains in use today, several popular restaurants and boutique shops were added to the area. It’s been more than 20 years since then, though; and you can’t prevent progress. Unfortunately, the Aloha Tower area is once again searching for an identity in the Honolulu waterfront and skyline. It has more-or-less ceased to be a marketplace and is now in the process of converting to college dormitories. With the exception of Gordon Biersch and Hooters – because college kids need their beer and party food – I’m fairly certain every other restaurant and retail store in the marketplace has been closed for dormitory construction. Nevertheless, the tower remains a Hawaii attraction that’s open to everybody. 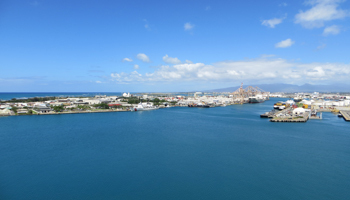 You can still walk straight up to the tower and take the elevator to the top for a free view out over all of Honolulu Harbor and the Honolulu waterfront. If you have enough people in your party, leave somebody below with a camera while you go up to the city-side balcony. Then he can take your picture with the attractive palm tree lined walkway in the foreground and you shouting ALOHA in back! Christmas card photo!